The wildly popular Boshie features a suede and knit upper with buckled hardware for a richly textured look. 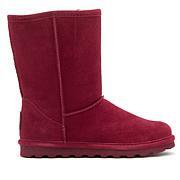 Wear them all winter long and then wear them with shorts and dresses well into spring. Love these boots! I wear them all the time. 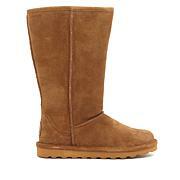 Fits true to size and very warm (but not too warm that they make your feet sweat). 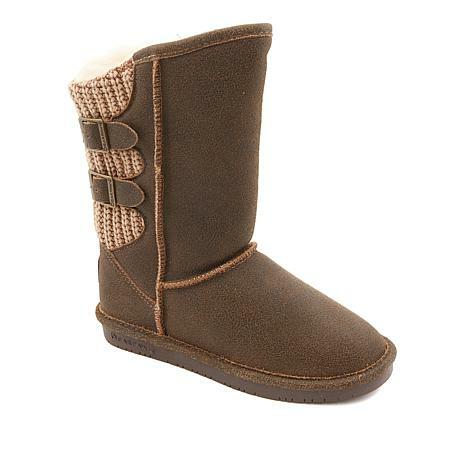 Cute, warm and comfy! These boots are sooo warm and comfortable, I dont want to take them off! Definitely worth buying! However, be sure to order 1 size up than you usually wear. 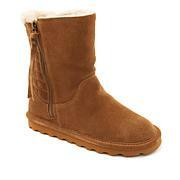 I just love my bear paw boots its been a long time coming. Im so happy that I can purchase a wide now cause thats the reason why I dont have boots like this because every store that I go to always have medium. So thanks you. Purchased this boot in wide to have when I want to wear socks or when my feet swell. The boot is easy to get on and is so comfortable right out the box, can't wait to wear out. If you truly have wide feet and a high instep this is the boot for you. I have medium to wide feet depending on life so the boot is perfect when I am more toward the latter. Glad the company started offering size 12, larger feet are often forgotten and wide is even harder to find.